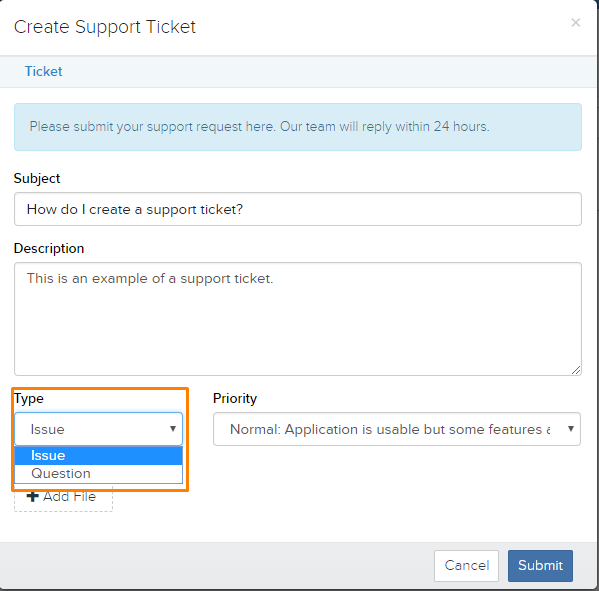 This article is a step by step breakdown on how to create a support ticket. 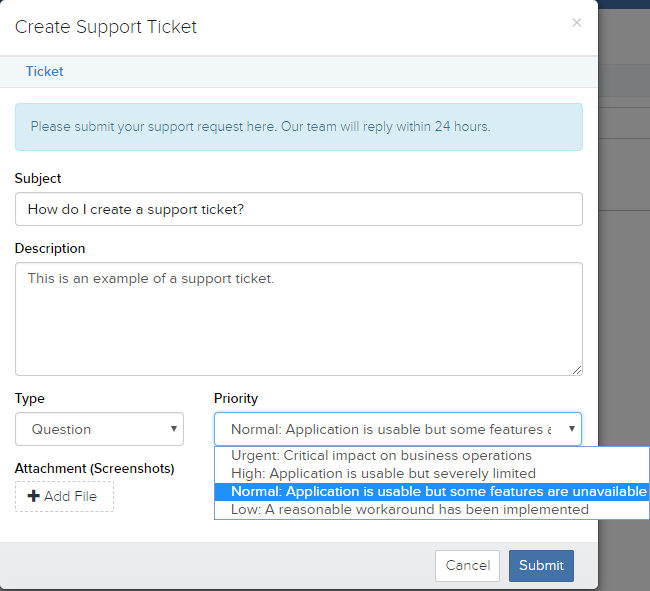 You can create a support ticket for two main reasons. Firstly, when you notice that there is an issue with your system and secondly when you have a question. 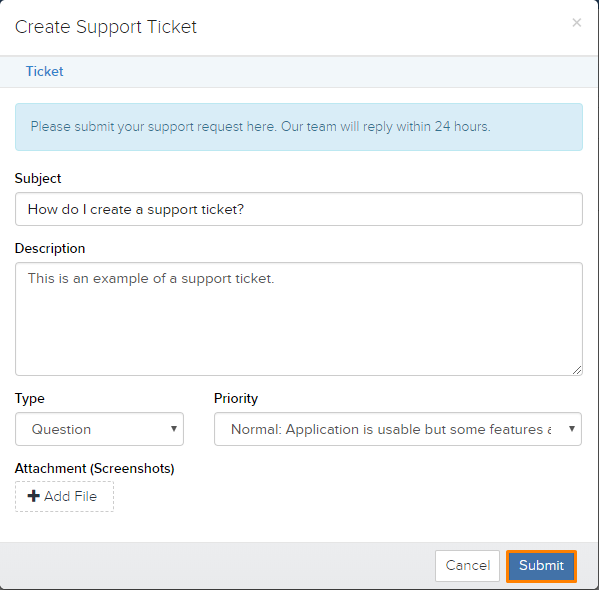 Once you have created a support ticket, a representative will get back to you within 24 hours. Where can I find the support ticket page? On the top right of the page, you will see a “Question Mark” highlighted in orange in the picture below. By clicking on the “Question Mark” button, a new page will appear as shown in the picture below. Click on the blue “New Support Ticket” button located on the top right of the screen highlighted in orange in the picture below. When you have clicked on the button, a new window will appear as shown in the picture below. Based on the example above, the ticket is a question rather than an issue, therefore we would select the type to be “question”, highlighted in orange in the picture above. There are 4 priority types for a ticket which are low, normal, high and urgent. Each priority and their meaning is shown in this picture below. If it is an issue that you are facing, we recommend uploading a screenshot of the issue so that we can further understand it. When you are done entering the details of the ticket, click on the blue “Submit” button, highlighted in orange in the picture below. When you have clicked on the submit button, an email will be sent to an agent and to the email that is registered with the system. 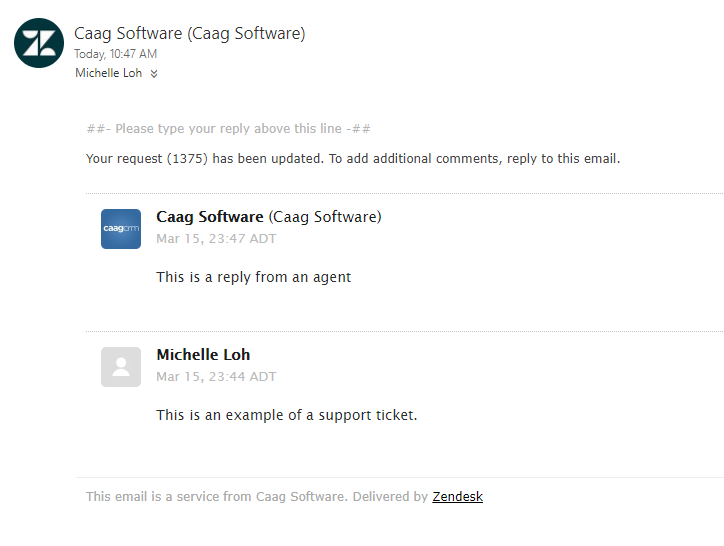 In this email, our agents can then reply to it to ask for further information which you can reply on as well. What are the tickets that you can see? The tickets that you can see from the support page depend on what user role you have. If you have an administrator role, you will be able to see all the tickets created by you and your users in the system. If you have a user role in the system, you will only be able to see the tickets that you create.